What & when should they eat before lessons? We recommend that children not eat an uncomfortably large meal before lessons. Beginning swimmers under two years of age should avoid food (especially dairy products) 2 or 3 hrs ahead of each lesson. Just like any other habitual skills, the rate your child will progress will vary from child to child. Some children may be more or less fearful, may be more or less athletically inclined, etc. Once a child starts lessons you can usually get an idea of how fast they will progress, although some progressions tend to take longer than others. One example is rotary breathing. This skill usually takes longer for younger children to learn. Our office staff will discuss your child progress with you. At Lori Swim School, we always maintain group structure while still attending to your child individual needs. Should parents be visible during the child's lesson? If the child is constantly asking for “Mommy or Daddy” throughout the lesson and if the teacher is having trouble competing for attention, it is generally best to have the parent “out of sight and out of mind” until the child begins to bond with and trust the teacher. Often, if the child thinks there is a sympathetic person close by who will “save them” from their “plight”, they will likely become melodramatic and emotionally distressed. We want parents to watch the entire lesson, but often prefer that they hide whenever their child becomes distracted by the possibility that Mom or Dad might bail them out of their situation. Who are your instructors and what type of training do they have? 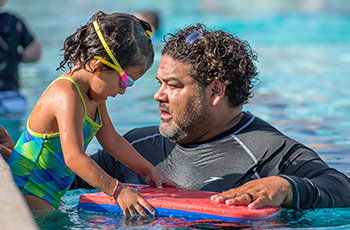 All of our instructors are certified Red Cross Water Safety Instructors (WSI). They are also CPR/First Aid and Lifeguard certified. Each instructor is chosen for their ability to relay information as well as for their love of teaching children. Our staff often returns summer after summer to teach. They have not only acquired a knowledge of our teaching standards but have also learned how to deal with every situation that may arise. There are two types of ear infections: one is caused by middle ear build-up secondary to Eustachian tube congestion and the other is caused by pool or bath water not drying up in the outer ear canal “Swimmers’ Ear”. To prevent the latter, parents can blow dry the ears or use alcohol & boric acid drops available at any local pharmacies. Swimming does not cause ear infections. Children with ventilation tubes in their ears can still swim, but consult your physician first. How long does it take them to learn? The teachers use Gentle Persuasion. Sometimes the emphasis is on “Gentle”. Generally, the students learn faster if the emphasis is on “Persuasion”. Most students become skilled enough to potentially save themselves, in about 10 to 20 private lessons although progress in our small groups can be just as productive. when the circumcision is healed and the umbilical cord has fallen off. The younger the babies, the more likely they are to accept the water and instruction. Human infants are adapted to swimming. The behaviors of automatic breath holding and swimming movements begin to fade as early as 3 months of age. Exposure to swimming provides the ideal exercise. They are not restricted to gravity and benefit from the cardiovascular exercise it provides. It gives babies a head start in learning basic swimming skills and improves bilateral coordination and balance. Where can I change myself or my child? It is best to come to lessons ready to enter the water (especially for beginners). We do have restrooms and changing rooms available for your use. Can my child swim with tubes in the ears? Yes, you can swim with tubes but always consult with your physician first. Are caps and goggles required? It is not necessary to wear a cap or goggles. Some swimmers prefer to wear a cap to keep hair out of their face. Some prefer to wear goggles to protect their eyes. We recommend that beginners not use goggles unless advised by the instructor. Once your child will put their face in the water and open their eyes comfortably, then we can introduce goggles. Swim equipment available for sale at each swim location. Ask the pool manager for assistance. The pools are kept between 84 degrees and 90 degrees. Based on our experience, 30 minutes is the right amount of time to keep your child interested, focused and happy in the pool. Our more advanced classes can last for a longer period of time. How do I schedule my child for class? Please call the office for a list of class times. If we cancel a class due to bad weather that class will be made up on a Friday. The Friday makeup will be scheduled in the month the class is cancelled. We DO NOT offer make up classes for missed lessons. There is a minimum of 2 sessions required upon registration. Payment is required at the time of registration.